Stentor has been known to orchestral stringed instrument players and teachers for more than 100 years. According to Greek mythology, Stentor was a herald with the voice and volume of one hundred other men together. Edward C. Doughty, a Professor of Music and teacher of the violin, registered the name 'Stentor' in 1895 for gut violin strings and rosin. Since the 1960s, more than one million young musicians have begun their musical careers with a Stentor instrument. Many of these same violinists and string players are now to be found in major orchestras and the teaching profession throughout the world. Stentor sells more orchestral stringed instruments than any other company internationally and offers unequalled value. In 1895, Edward Chapman Doughty, a Professor of Music and a minor composer, decided to form his own publishing company. He called it the 'Harmonic Publishing Co' and used the name 'Stentor' as the brand name for rosin and music strings, particularly violin strings. A range of violins was imported and sold under the Stentor name. He operated from premises in Wandsworth, South London, UK, firstly at West Hill, and then from his music shop, Doughty & Co at 354 York Road. His son, also Edward Chapman Doughty joined the publishing business in 1919. The business moved to Wallace Crescent, Carshalton in 1927 and the new Stentor rosin, made to a special formula was introduced with great success. At this time the trading name was changed to 'Stentor Music Company' and piano accordions and a range of fretted instruments were imported. Following World War II, publishing and importing ceased and in the difficult time of the 1950's the business moved to smaller premises at the Old School, Woodmansterne. 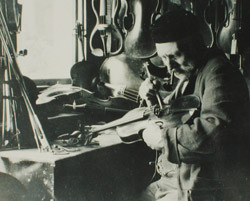 The Stentor rosin and gut strings continued to be made and distributed but the emphasis moved to retailing and to the reconditioning of stringed instruments. Stentor Music Co. Ltd. was formed in the early 1960's by Michael Chapman Doughty and other members of his family. It has grown from very small beginnings to become the premier wholesale distributor of acoustic musical instruments in Britain. The Company has always specialised in stringed instruments of all kinds with an emphasis on educational instruments. Today the company still retains this specialisation, but our commitment to acoustic musical instruments is also extended to brass and woodwind instruments. In addition, Stentor offers the largest range and best stock of parts and accessories in Britain. Our total involvement ranges from research, manufacture and improvement of stringed instruments, to the supply of specialist woods for hand makers and the underwriting and organisation of major concerts, which enable the presentation of many international artists. Over the last thirty years, Stentor has contributed greatly to improved standards of playability in instruments for educational use. In 1990, Stentor moved to its present freehold premises in Reigate. In December 1995, the year of the Stentor centenary, the Company opened a wholly owned subsidiary factory in Taixing, China. The factory employs local people making Stentor violins, cellos and other stringed instruments. These are exported to more than thirty countries and the Stentor trademark is registered by the Company in all major markets throughout the world.